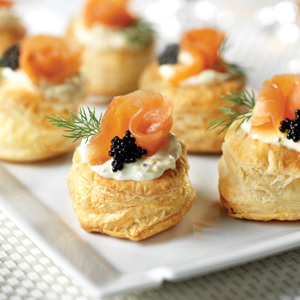 These caterer-style appetizers are so easy to make. Simple yet sophisticated...it just doesn't get any better than this! Heat the oven to 400°F. Stir the crème fraîche, lemon zest and black pepper in a small bowl. Unfold the pastry sheet on a lightly floured surface. Using a round cutter, cut the pastry sheet into 12 (2-inch) circles. Place the pastry circles onto a baking sheet. Prick the pastry circles thoroughly with a fork. Bake for 12 minutes or until the pastries are golden brown. Let the pastries cool on the baking sheet for 10 minutes. Spoon 2 teaspoons crème fraîche mixture on each pastry. Top each with 1 piece salmon and 1 sprig dill. 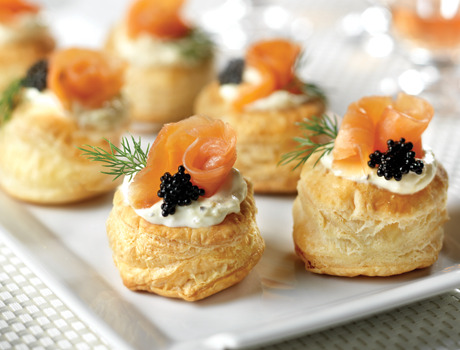 Top with the caviar, if desired. Recipe Note: Customize the recipe by cutting the pastry into shapes other than circles. Try stars or hearts- just make sure that the cutter measures about 2 inches across.